The Apple Watch has been available for about six months, and it has quickly become the best selling wearable device released to date. With that success comes a host of accessories including a variety of interchangeable bands, waterproof cases, and charging docks. Believe it or not, there are even accessories that allow you to attach the Apple Watch to the handlebars of your bike, in a sense turning the device into a connected cycling computer. 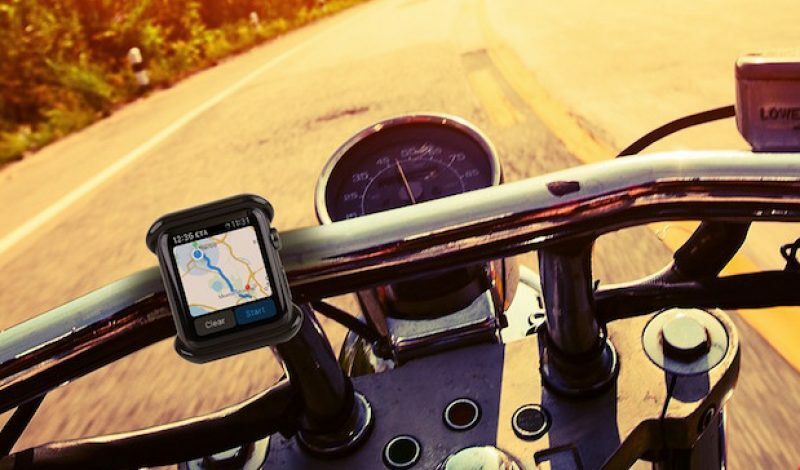 Satechi, a company that makes numerous accessories for smartphones, tablets, and laptops, has announced the Apple Watch Grip Mount, which is designed to quickly and easily attach to your handlebars or steering wheel. The Watch is then clipped into place, putting it within easy reach of the rider. This allows the device to assist in navigation while out on a ride, while also providing music controls, text messages, notifications, and other important information as well. Using software like the built-in Fitness app or MapMyRide, also gives the device the ability to track distance, speed, pace, and so on. The no-frills mount costs just $15, and is available in both 38mm and 42mm versions to accommodate both sizes of Apple’s wearable. Meanwhile, the Cyclip was launched on Kickstarter way back in the spring, but failed to gain any traction at the time. It promises to be a more elegant and secure way of connecting your Apple Watch to your bike, with a very rugged and durable housing. It was to have cost $49.95, but at the moment its status is unclear. Hopefully the designers of the Cyclip will find the funding they seek so they can bring this handlebar mount to the market soon. Obviously the Apple Watch is designed to be worn on your wrist, and not necessarily mounted on a bike. But, as noted above, doing so provides some nice advantages for cyclists. You’ll lose the ability to track your heart rate of course, but you’ll gain the convenience of actually being able to interact with the device while riding. Currently, it isn’t exactly safe to do much of anything with the Watch when you are wearing it and pedaling a bike at the same time. Placing it on the handlebars does give you the ability to interact with the gadget directly, even while sitting in the saddle. As the Apple Watch continues to grow in popularity and sell more units, we’re likely to see more such accessories become available. I defintely like the idea behind having abike mount, but would prefer one that could also potentially charge the Watch’s battery as well. Perhaps we’ll see something like that in time.